On Friday, India's benchmark Nifty saw some brisk selling and markets finished near the lows of the day. The selling pressure reversed 75% of the previous session's gain and thereby producing the technical pattern known as "Dark Cloud Cover" (DCC) on the daily charts. Questions that come up: (1) was Thursday's thrust above the medium trendline connecting through November_January highs a fake-out? (2) Is it going to beget further selling; (3) How does one position - buy the dip or sell the rip? I wish the answers were plain and simple. The Nifty is in the midst of a very complex correction. There are various ways to interpret the movement that has come off the June low of 5195. What is however clear, whether one is bullish or bearish is that, that a decline is under way and only the amplitude is in question. At 5735, wave v was equal to wave i (see chart for labelling), which is a normal ending relationship. So the high at 5740 was just 5 points over the ideal scenario. If the current decline continues beyond 5480-70 zone, the odds that the high at 5740 was a head-fake would increase. As long as Nifty holds this zone of 5480-70, I see this corrective rise having potential to make an attempt at more push higher which may end slightly above 5750 or fail at 5750. If I were a nimble trader with 1-3 day time frame, I would trade banks and cap goods from the negative side. I were a conservative trader, I would stay very light until Nifty drops to 5480 or breaches 5750. It is obvious from the chart that the Earthquake occurred during the down trend and did not create any reversal on its own. Now let us a look at the Latur Earthquake that left nearly 8000 dead in India and its impact on Sensex. What about the Tsunami of 2004 that left 230,000 dead in Asia? Looking at the charts, if one were to think no natural disaster occurred on Dec 26th 2004, he/she can be excused!! The picture is similar even if one looked at the man-made disasters like Bomb blasts and terrorist attacks! While the reaction may have been pronounced, would it have mattered had it occured when the market trend was up? So, the next time you hear someone on media say that such and such exogenous events is causing the markets to decline you might want give these charts a thought. While there might be initial knee jerk reactions, these events do not even cause short term reversals!!! All one has to know is, what is the trend. Uncategorized Comments Off on Correction or trend reversal? In June, I had posted a note on this indicator and wanted us all to keep an eye on it. 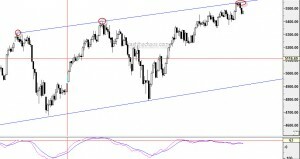 However, the indicator averted a double top risk and stayed above the previous trough during the May-June correction. Once again its time to keep an eye here. If this indicator dips below the orange line, it would be first warning sign that the existing uptrend is starting to turn weak. Although the possibility of a trend reversal exits only below the red line. I will post an update on this indicator if the indicator dips below either of these two levels. However, this time around there are couple of things that are loaded in favour of the bearish camp. One, Reliance is an under performer unlike the previous time. Two, SBI, a key leader in this rally, has also started to show pronounced weakness. Thirdly, there is a pronounced negative divergence on Nifty/Sensex daily charts. What's favouring the bulls? The longer term momentum has matched with the price peaks and one possible wave count points to another leg up (need not result in a high though). The readings on NSE India VIX are approaching extreme levels. Although they haven't yet reached the most extreme readings since its inception but it is at its lowest readings on a closing basis. The current level of complacency is much more than it was during the January 2010 highs. As can be seen from the chart above such low readings have often corresponded to significant peaks of April highs, July/Aug 08 highs and May 08 highs. Had it not been for the limited history of India VIX, I will be sitting with a bucket load of puts. But being a conservative trader, I prefer to act on things with much longer history. If aggression is your cup of tea here is a chance to pre-empt the market. Nevertheless, this is a chart that might be worth every trader's attention. 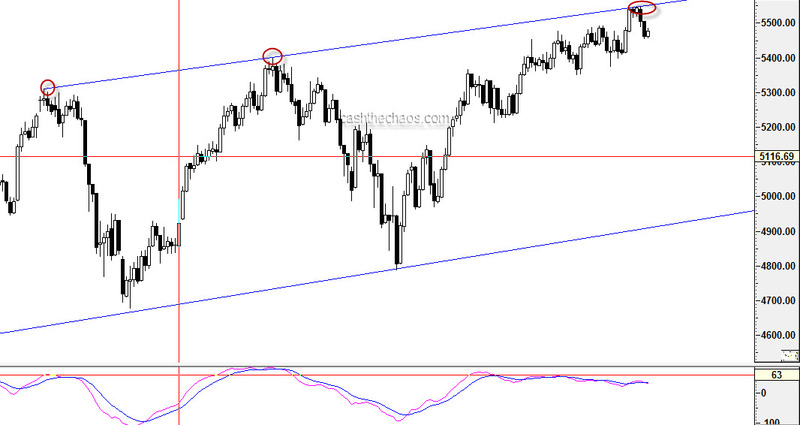 As can be seen from the chart below, the channel lines are putting pressure on the Nifty. Also, momentum peaks continues to disagree with the new price highs. 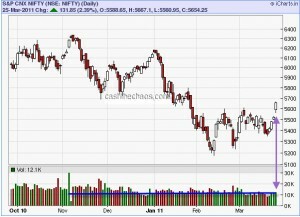 In my March 8th post, I had projected that Nifty should reach a minimum target in the region of 5600 but we dropped that stance in April expecting a correlated breakdown along with US markets. After initially declining to 4800 on the Nifty, Indian markets showed great resilience and outperformed almost every market in the world. So what has this got to do in the current context? The current high of Nifty satisfies the minimum level required for wave 5 completion (approx equals wave 1). Also, if Nifty closes below 5452 today (farther from this the stronger the signal ), a moderately negative to highly negative candle will be formed on the weekly charts. Looking at the USDINR crosses, a symmetrical triangle seems to be in play and the upper borders of this triangle shares a common boundary with a medium term trendline. A convincing move above this level will mean more weakness for the Indian currency and as a corollary further weakness for the stock markets. My guess is that the Rupee will hit the upper borders today and pull back into somewhere into middle of the triangle to lower borders of the triangle, gather steam and then push past the 47.15 breakout level. If this scenario pans out - there might another push towards the high for the Nifty after the current decline. Let us see how the market pans out. We were more focussed about going to cash and buying OTM puts as protection rather than going short between April and July. Considering that September is historically one of the weakest months, we will consider being short in a small way and try to build on them if situation warrants.